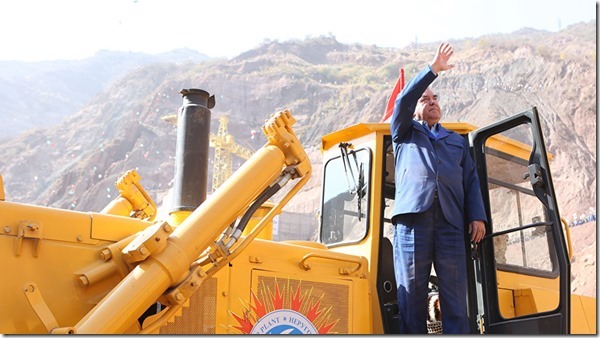 Tajikistan on October 29th started construction of the controversial $3.9 billion USD Rogun hydropower dam on the Vakhsh River. The dam – designed with a height of 335m – is part of the 3600MW Rogun hydroelectric project (started in 1976), which may become the largest hydroelectric project in the region when\if completed 20-25 years from now. Italian construction conglomerate Salini Impregilo in July 2016 won a $3.9 billion contract to build the structure, whose opening ceremony on October 29 was presided by President Emomali Rahmon driving a bulldozer into the riverbed. Salini Impregilo is known for building hydropower projects with high negative environmental impacts in Ethiopia and Georgia and were associated with suppression of local dissent. The ceremony came a day after a malfunction at Tajikistan’s biggest hydro-power plant caused a nearly three-hour blackout across the country caused by malfunction at Nurek Hydropower Station on Vakhsh. Authorities say the Rogun Dam will be able to provide electricity for the whole country. They say the dam could also provide parts of Afghanistan and Pakistan with cheap electricity. This electiricty could be transmitted by CASA-1000 power line to be built with support of the World Bank. In 2015 the World Bank Inspection Panel refused to honor a compliant from civil society groups claiming that the new power line will lead to major impact on region’s hydrological regime due to new hydropower construction. Downstream Uzbekistan has voiced concern that the dam in Southern Tajikistan will reduce water flows to its cotton fields. The Rogun Project has been the main stated reason for a long conflict between upstream and downstream countries of the Aral Sea Basin, that led to deterioration of water and energy sharing agreement in Central Asia reached at the turn of the century. Tajikistan is a relatively poor country and expenditures for Rogun Hydro construction may create enormous debt burden. In previous years the Government forced citizens to buy special bonds to support construction of the dam. This example shows how former Soviet states are obsessed with old-fashioned mega-infrastructure projects, which have been delayed many times and are highly unlikely to represent the best options for future development.